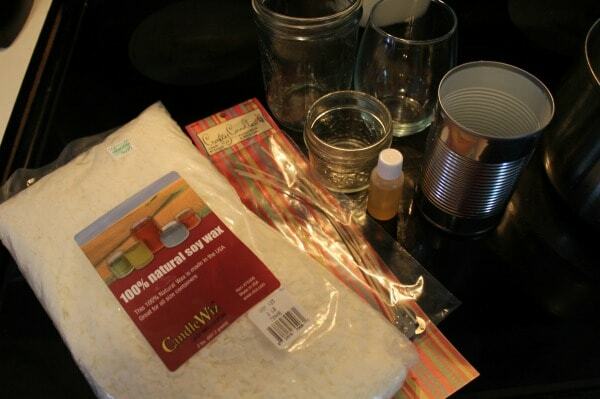 Use this tutorial for how to make citronella candles to make mosquito repellent candles. Citronella candles have long been used to ward off pesky mosquitoes. There is no reason why they cant be pretty as well as effective. Making them yourself means that you can make them stronger (store bought ones never seem strong enough for me) and in any container you want to accent your porch, patio, or poolside. Pick up a few items from your local craft store, gather some containers from around the house and make a bunch of bug candles to scatter around your yard or another outdoor entertaining area. I love to use soy chips to make candles and was able to easily find soy chips at my local craft store, as well as wicks. I prefer soy candles as they are made from a natural resource and use fewer additives (check the packaging), and are cleaner burning than paraffin, last longer, and hold scent better. 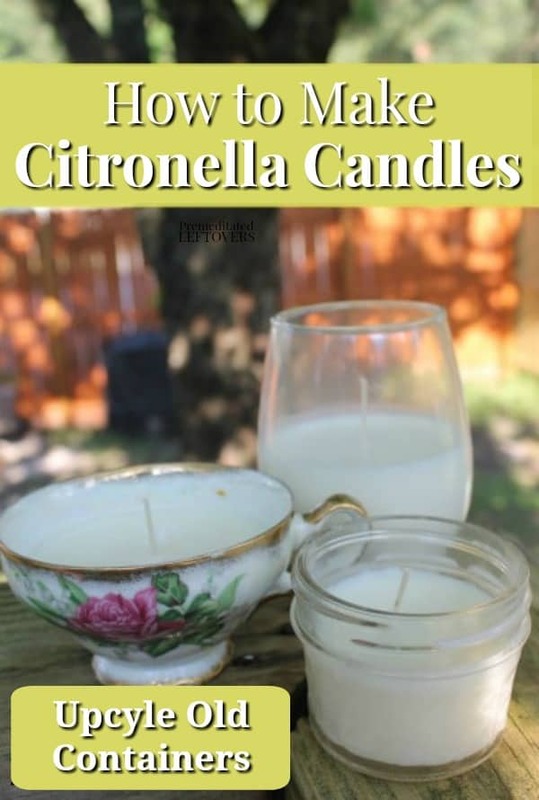 My DIY citronella candles recipe below uses 3 drops of citronella essential oil per cup of soy wax chips. You can alter the amount of citronella oil you add to achieve the desired strength for your outdoor citronella candles. 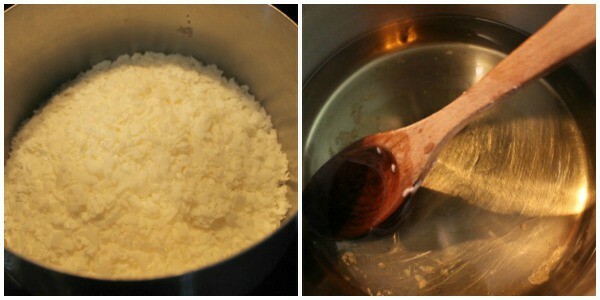 Place soy wax chips in a small pan over medium heat, stir continuously until melted with a wooden spoon. Place containers on a cookie sheet and place in an oven preheated to 350 for 5 minutes, remove from oven. Dip metal disk on wick into melted wax, immediately place on bottom of the desired container to fix it in place. 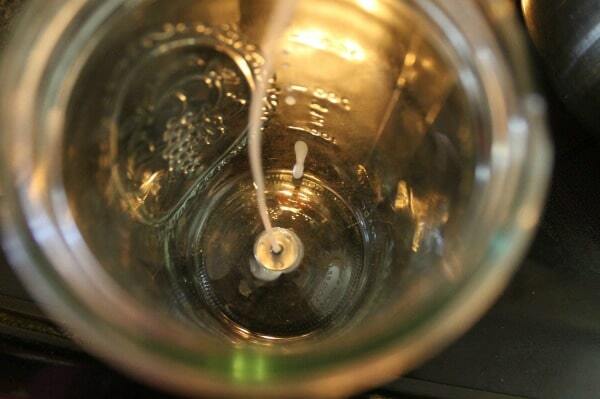 Stir essential oil into melted wax well, pour wax into pre-warmed containers. Prop wick up in the center with pencils or sticks. Allow the candle to sit for several hours until set. Trim wick to 1/2″ tall. 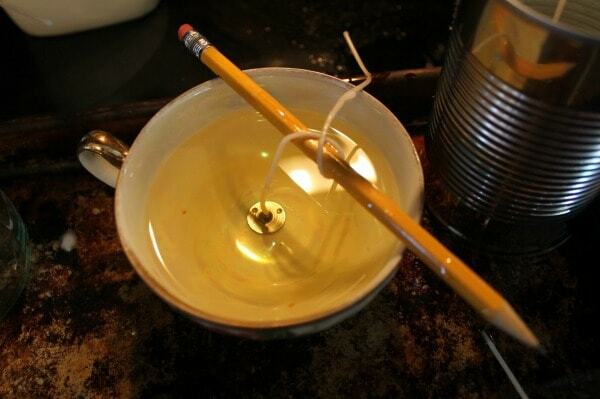 To make your own candles use clean, empty vegetable cans, mason jars, tea cups, or old cleaned out candle jars. * Tip- To remove old wax from a candle jar, place it in the freezer until the wax is brittle, it will pop right off the glass. I love your citronella candles instructions and I am keen to try it out myself. How many drops of citronella oil would you recommend in 6 cups of soy chips? Use approximately 3 drops per cup, so 18 drops for this batch.